Why does an eight year old boy abuse a cat? I feel this is an awfully difficult question but we need to explore and discuss the subject because it is very important. These are my thoughts, a complete layperson, thinking aloud. Elisa has reported on this subject and I have touched on it too. I am prompted to write about it because of a short story on the internet in which a person sitting in a car in a car park saw a boy in the car next to hers abuse a cat. The father had left the two in the car while he went to the shops. When he returned she confronted the man and he said nothing and drove off. This almost sounds commonplace and it almost is. But it is hugely important that this boy gets help quickly. His whole life is ahead of him and it looks like it is going to be messed up. In my view, it is subject that is neither about the cat nor the boy but the parenting. It is a reflection of poor parenting that has run from generation to generation forever perpetuating the same problem. However, I realize that it is not necessarily solely about that. As I said, this is a frighteningly complex societal problem. My gut feeling is that, in this instance, the boy's actions were an expression of anger and power born out of hopelessness and powerlessness, while lacking a true understanding of the consequences of his actions. In other words he had no empathy with the cat's pain that would have been a barrier to the abuse. I also feel that a lot of parents are not aware of the impact that their actions have on their children; often a lifelong impact. It may well be that the boy's father is stressed, angry and powerless in his world, if he is psychologically healthy. The father passes this anger on to the family members. The boy has no control over the inhospitable family environment that the father creates and becomes angry himself, in part because he has learned anger from his father and in part because he is mad at the world and the situation that he finds himself in. He wants to hit out, hit back, hurt his dad but he can't and he can't understand. The boy has neither power nor control over his life because he is a child and children are vulnerable to the behavior of adults, their parents in particular. Down the chain of vulnerability is the family cat. The child vents his anger and the next in line and at the bottom of the family hierarchy is the cat. I can understand why people become angry, it is a normal human condition particularly when life becomes stressful due to employment difficulties etc. But to vent that anger on a living creature is morally reprehensible. The eight year old boy abusing a cat may well damage himself psychologically in the process. He has learned from his parents or peers that it is acceptable to abuse a cat. The fact that the father did nothing in response to finding out about the cat abuse will reinforce the child's unacceptable behavior. If the boy learned this from his peers it is up to the parents to re-educate. This father seems to have no interest in doing that. If nothing is done to change the situation, the boy may well grow up to be like his father and the cycle of abuse continues. I feel this happens a lot. 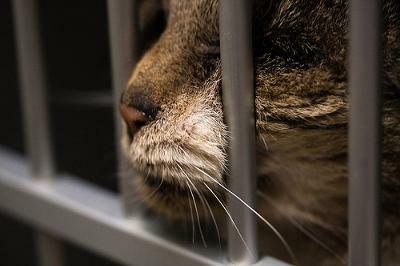 The domestic cat and dog are particularly vulnerable. The cat is quite passive and the dog obedient. I feel that what can stop this cycle of learned abusive behavior towards animals is the cultivation of an empathy for animals. The boy has to learn to feel what the cat feels. At least then he will be more likely to express his anger against an inanimate object. The complex cycle of poor parenting, anger and a feeling of powerlessness is a much harder nut to crack as the answers lie not only in individual behavior but in the wider society. My thoughts are probably over simplified. Other views/ideas are welcome. The Declawing Disconnect - another example of abuse born out of a lack of understanding of our place in nature. I agree animal abuse is a huge problem in society these days. Parents dont necessarily parent their children today either. Most children spend their days at day care or school and parents have no way to monitor their children. Not only that but their is no supervision of the children at all on the streets especially as they become older. I found that out last summer with some kids wanting to shoot my racoons with BB guns. They were asking the neighbor if it was Ok and I just happened to be sitting on my deck at the time. I freaked out!!! WE love sitting out at night watching them especially when the mommas bring their little babies. Its against the law. I think they should have animal abuse as part of the education process in the schools. But they dont and they never will. Most humans see animals as competition to our survival and have little if no feelings for them at all. It's terrible to think how many animals are abused because the children of the family grow up seeing their parent kicking the dog or throwing the cat across the room etc. Even when they become old enough to realise it's wrong, they probably think animals don't feel pain as they do. The parents are to blame of course, but some children of bad parents turn out well when they grow up and think for themselves and see how others treat their pets kindly. Sadly some continue to abuse animals all their lives without even a pang of conscience. I think it's like the connected and disconnected people you wrote about Michael, it's as if there are two species of humans. We watched a documentary the other evening about how humans evolved, one sort died out but the other thrived and we are descended from them. I wonder if we'd all descended from the other sort everyone living since them might have been good people with no evil in them ? Or did the other sort not all die out and some of us are their descendants ? We will never know but there definately seems to me to be two sorts.